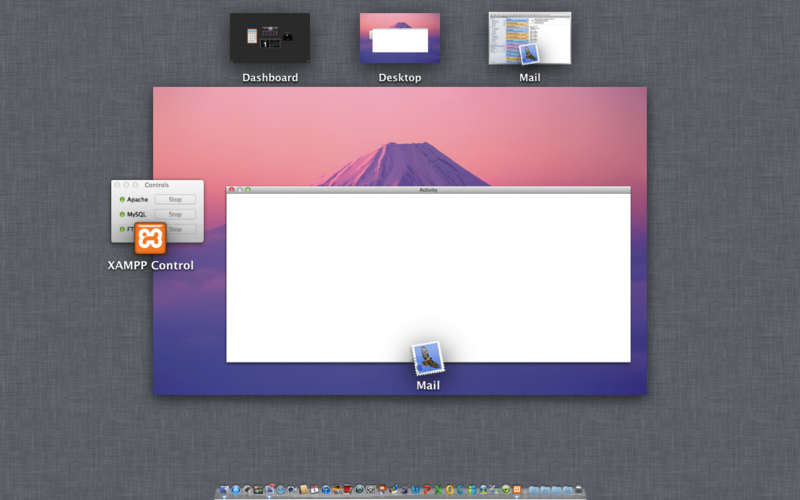 Home/Mac/Re-opening Full-Screen Applications in OS X Lion. Hit or Miss? To put an open application into full-screen mode, simply click the arrows in the top-right corner of the application’s window. However, re-opening an application in full-screen appears not so straight forward. My understanding is that if you want an application to re-open in full-screen mode you mustn’t quit the full-screen application using command-Q. Instead, you need to navigate to the Desktop, control-click the application icon in the Dock and click Quit. It appears also that you need to do this every time you want the application to re-open in full-screen mode. However, this seems a little inconsistent. Take Mail for example. Open Mail in non full-screen mode and open, say, the Activity window (Window > Activity). Now put Mail into full-screen mode and launch Mission Control. You’ll see that as a full-screen application Mail occupies its own space. Mail’s Activity window, however, is shown on the Desktop. Quit Mail while in full-screen using the method described above and you’d expect Mail to re-open full-screen. It doesn’t. Why? I suspect it has something to do with the Mail’s Activity window. So, close the Activity window first before putting Mail into full-screen mode. Now quit Mail using its Dock icon. Open Mail and it’s full-screen. I’ve experienced the same problem when Mail’s Preferences window is open, but not with Mail’s Photo Browser nor Address Panel windows. The same is true of Safari with either the Preferences or Activity windows open. iTunes however seems to suffer no such problem. It re-opens in full-screen regardless of which windows were open. Odd. Whether this is expected behaviour or a bug, the way to have a fair chance of applications re-opening in full-screen mode is to close any additional application windows first. I think this is a bug. I’ve reinstalled OSX 10.8 and in the beginning, some apps work fine, then for some reason, it stops working. It is, as you say, hit-and-miss. Something Apple need to address, if they have the brains for it. I think they are heading for drone territory, which is a shame, and they deliberately **** things up so we can look forward to a hopefully consistent solution. Adobe doing the same, too, it seems …….. I truly think the fuzz around full screen is totally unrealistic. People should realize the limitations of that idea – especially in Mail, where you can’t have multiple messages open at a time and dragging data, attachments or anything into them is simply impossible. I can’t really follow this. For me it doesn’t matter if I have additional mail windows open or not, and it doesn’t matter if I close Mail via cmd-Q or Dock icon. And yes, it’s fullscreened when I close it. My experience since writing the article is that the behaviour of full-screen apps is inconsistent. I agree, a Dock option would be useful.